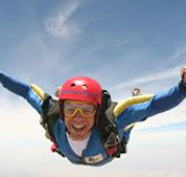 Our partnership with skydive for free, allow individual and group to skydive, and raise fund for Able Foundation. Able Foundation is a charity that is dedicated to improving the life of people with learning disabilities – we provide opportunity, choice and specialist wellbeing support to people with learning disability; to find and keep work, live in house of choice, live healthy , and learn skills that leads to greater control of their own life. Your fundraising donation makes a significant difference to the lives of people with learning disabilities that we support, and below are few examples of how we use the fund you have helped raised.